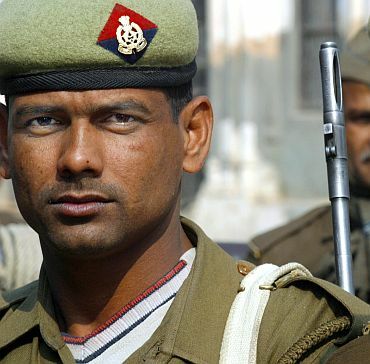 The incident involving an assault on a lady police officer by her own constables, caught red-handed extorting money on a highway in Uttar Pradesh's Barielly district, late Thursday night has exposed the deplorable decay in policing in India's most populous state, Uttar Pradesh. 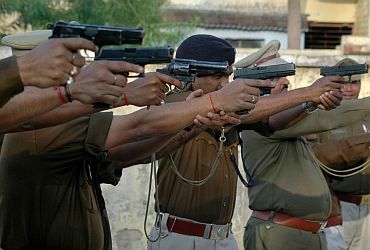 Caught red-handed while indulging in extortion, the three policemen and a civilian went to the extent of attempting to kill their own superintendent of police (Traffic) Kalpana Saxena, who dared them. In what seemed like a page from a Bollywood thriller, Kalpana got into action on a telephonic complaint by an army official and literally caught three men in uniform extorting money from every passing truck. They tried to flee in a waiting car, but Kalpana grabbed the collar of one of them and went on running along with the vehicle for nearly a kilometer until she was pushed away by the three constables who sped away. "Apparently, they were quite sure that I would come under one of the speeding vehicles on the highway, but somehow I just managed to roll down the side of the road with bruises on both my arms and legs. Thankfully, I did not suffer a head injury either," the bandaged daredevil officer told rediff.com over telephone from the hospital where she was rushed by her gunner. "This could happen with anyone. So we are not going to take this lightly," she asserted. An officer of the 1990 batch of Provincial Police Service, Kalpana is widely known for her forthrightness and daring acts, often witnessed only on the celluloid screen and rarely visible in real life policing. 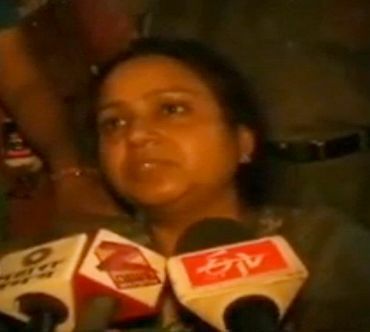 According to locals in Bareilly, extortion by cops had been rampant in and around the city. But rarely have they seen an officer who would be ready to take on the corrupt. "Most of the senior officials invariably become a party to the hefty underhand income that cops mint here," remarked a senior citizen on the condition of anonymity. Even as Barielly Deputy Inspector General of Police NK Srivastava ordered immediate suspension of the insolent cops, his men have failed to track all of them down. "We have arrested one of them identified as Manoj Kumar Singh and I am sure we will get the other two cops -- Ravinder and Ravendra Yadav -- as well as their unidentified fourth accomplice very soon", Srivastava said. Zonal IG police Gurabachan Lal was also very firm about 'deterrent action against the guilty cops'. He said, "Since there was sufficient evidence against each of them, they could even lose their jobs." Both senior cops, however, remained evasive on the question of such extortion being a routine practice in the region. "We do not know anything about it, but we are taking stern action now that the culprits have been caught", the DIG claimed.